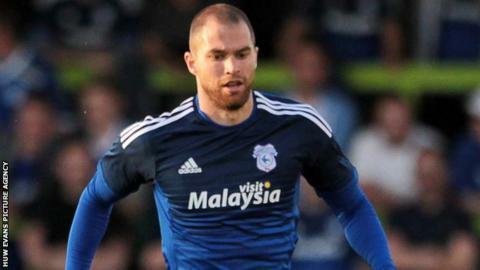 Defender Matt Connolly has signed a contract extension that will keep him at Cardiff City until the summer of 2019. Connolly joined the Bluebirds for £500,000 in August 2012 from Queens Park Rangers. The 28-year-old centre-half was a member of the Cardiff team that won the 2010-11 Championship. "I've enjoyed promotions in recent years and that's what my focus is again in 2016." Connolly, who began his career as a trainee with Arsenal, is five games short of 100 appearances for Cardiff. The Barnet-born player spent the latter part of the 2014-15 season on loan at Watford in what Bluebirds manager Russell Slade described as "a business decision". Cardiff chief executive Ken Choo said Connolly's performances have been of an "exceptional standard". "Securing the services of Matt on a long-term deal was of huge importance to us this season," Choo said. "We want players at Cardiff City, like Matt, who show their commitment to the cause by the way they handle themselves on and off the field."